EDIT: I have reconsidered the pricing and gone through the calculations. The book will show up for sale now at $12.99 US, which is much more reasonable and probably will actually sell a few. haha. Please, if you purchase either the digital or paperback copy, write a short, honest review. It will help immensely! Thank you so much for following me! After debating with myself for weeks on this, I decided to go ahead and reformat the book for a paper back version. Amazon give’s authors a 60/40 cut. Author’s get 60%. Sounds wonderful until you actually realize that out of the author’s cut of the “profits” from the book they take out printing costs. This is one reason I never intended on doing hard copies of anything. Setting a book at minimal cost is great, but not going to make an author money, and only gives money to Amazon. As an example, the printing costs for this book are 6 dollars (and some odd cents). Setting the cost of the book at 10.50 would net the author .03 cents per copy. Setting it to give a better “profit” for the author entails setting the cost significantly higher than either a reader or this author wants. But, for the time being, we set the cost of the book to provide a $5 bill for each copy sold. I don’t expect anyone to spend 20 bucks on my books, and honestly, I want to keep the cost below 10 dollars, but until such time as folks start actually buying them in droves (hahaha, sorry I know my work is good, but I am cynical, everyone wants “Free”) I’m going to highly recommend you jump on the Kindle Book links and get the digital copy (at $4.99). Yeah, it’s more profitable for me, and cheaper for the readers. But, the paperback is available if you want it! So, if you want to read a good book, pick up “Aftermath’s Children” on digital today. Don’t worry if you do not have a Kindle, you can use the Cloud reader from Amazon, or you can download the Kindle App for your iPhone or Android, or your tablet! Aftermath’s Children is live on both Amazon and Smashwords. Please give Amazon a few moments to do the proper updates, as I had to correct the pricing scheme, it was wrong at first. I’ll post the links at the bottom of this blog entry. Originally, the Space Station Estrellita started as a Mars jump off point, but when a wild AI got loose and assisted the human race in its own self annihilate, a few men and women put a plan together to “save” the human race. Estrellita is the home for over four hundred-fifty people, many of whom were born on the Space Station, and many want to go back to Earth. Some do not. With the aging systems aboard the Station beginning to fail, there may be no choice for any of them. Doctor Ernie Oppenheimer felt responsible for their current predicament, after having been put in charge of the original rescue of the human race. Now, some thirty-plus years later, he was aging and wanted to go back to Earth. The people on this station deserved better than to remain here, eventually to die off. He had been formulating a plan for years and it seemed as good a time as any to implement it. He needed a few allies. Besides, he’d always been good at getting what he wanted. Unknown to Oppenheimer, there was another who had conflicting plans. 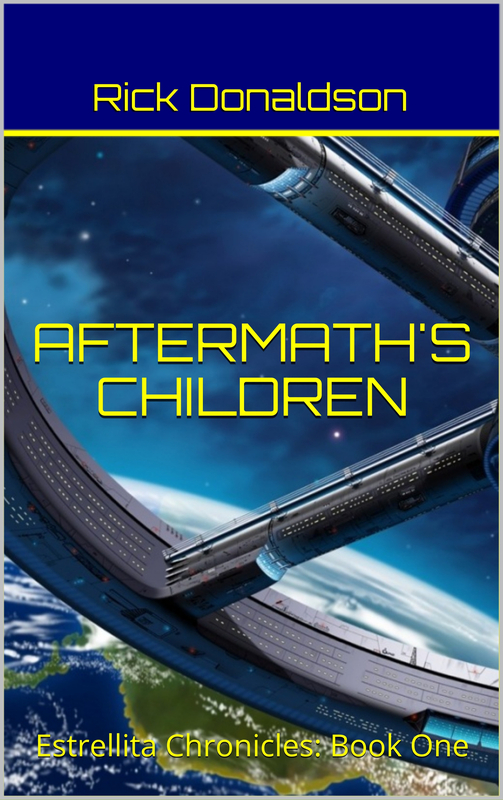 Aftermath’s Children, Book One of the Estrellita Chronicles begins in space and when the forces of good and innocent meet deranged and evil, someone is going to come out on top and someone must lose. If you do make a purchase, please review the book when you’ve completed it! If you have the time, I’d appreciate feedback here as well. I know some have already given me feedback, and I haven’t responded directly to most of it because, honestly, I’m “fixing” issues as I spot them. One friend told me there were some “inconsistencies” but as it turns out, they aren’t really inconsistent, because there is a background story that goes with this series. That story will eventually come out! As I posted back in February the first book is completed. Life has been extremely busy for the wife and me, living on a boat. Around that time of the year, we took Adventure out into the ocean and ran back with our tails between our legs. It has been a tough time trying to get back out there, but we’re ready. We landed in Southport, NC and made it home for a time. I got a part time job at a marina, and we’ve made two, long trips, back to Colorado for medical exams and visitations to the children, grand children and our new, baby great-grand daughter. In the mean time I put out a call for art work. And I received exactly squat from all the friends, family and people whom I offered to pay for decent work. That time has come and gone I guess. No one wishes to help. Few people wish to read a draft of a book to help you out. This is why people hire editors to work for them. Something I simply can’t afford these days. That’s ok. I can read. I can edit. I can write. And I can figure out how to use computers and do art work. Hell, I’m a pirate, I can STEAL it if I’ve a mind to do so (no, I didn’t actually, but I could have). Haha. Anyway, I have some art work finished for the first book. I have the first book completed. I have the second book nearly completed, the third book is fleshed out and the “Book Zero” is in progress as well. So “Estrellita” is nearly done. I want to upload the manuscript here in a couple of days. On Tuesday this week coming up, we’re planning to depart for points south, so I want to try to get the book ready by Sunday night. I’ll see what I can do. So, get ready for the adventures of Ernie Oppenheimer and the rest of them. I have several test readers going through it now. I have found some minor errors (punctuation missing in a couple of places, and a word or two dropped). I am also awaiting cover art at this point. I want to go to publication soon – in a month or less. Life sometimes gets in the way of doing what you really want to do though. We shall see. Currently, the wife and I decided to remain here in North Carolina, and I’m taking a part time job at a marina, for fun and to basically pay for the slip. The town of Southport is wonderful, and the people are simply awesome. The one and only local brewery is called “Check Six” and right up our alley, with consistently great beers across the spectrum, the owners are wonderful folks, friendly and they are working to open a connected restaurant. Signing off from Sailing Ketch Adventure! Over the past few months I’ve pretty much ignored my own writing (except I have been working on my SF series) and I’ve somewhat ignored some fan requests. It’s not really that I ‘ignored them’, my wife and I have been busy staying alive. We traveled the East Coast by in the sailing ketch Adventure from August through October, stopping to visit places, friends and in general learning how to sail the ketch. We’ve run into a lot of engine issues, a major storm (a nor’easter) we were caught in caused the engine to shut down and we lost power, and had rigging issues we were on our way in to a marina to have repaired. That whole thing is a story in and of itself. Basically, I have had multiple requests for my book, Basic Survival and Communications Skills in the Aftermath, Kindle Edition to be printed in a hard copy format. That is really the part I’ve ignored. I’ve had a couple of dozen requests over time to do a hard copy, and people who have asked have stated their reasons, ranging from the obvious (My kindle probably won’t work if we have an EMP) to more unusual (I collect survival books) to the interesting (I’d like to give it as a present to someone); and there were others but I won’t go into them all. So, I have an order from my fans or would-be fans, if they had my book, which they don’t, to produce a hard copy version. I have been mulling this over as I am working on the SF series to get those to publish this year (at least one of them) with the others to quickly follow, and I DO want those to be available in hard copy. Therefore, it’s time to work on making some small changes to the Communications Skills manual, and do a second edition, add some material and take out some slightly outdated. Then to get it into a print-on-demand edition. I have a lot of reasons for preferring POD instead of a normal hard copy edition. If we go through a publisher they will prints a few thousand copies and there will be storage fees and so forth. As a “starving artist” – that is a retiree without a current incoming, living on a sail boat and paying fees for everything from doing laundry to going to the bathroom, one has to be careful with their outgo. This book was never meant to be a major source of income (and has proved thusfar to be exactly that, a “not major income source” haha) but it can’t also turn into an outlay for me either. So, digital format is the one thing that makes it cheap to produce and keep the price down to the customers. Producing a hard copy will absolutely increase the price of the book (printing costs, cover art, and shipping, etc) but will not increase any income for us. This is one of the reasons I have balked consistently at producing a hard copy. But, the readers and wannabe readers have spoken. I will therefore endeavor to produce in the next few months, a print copy for those who’ve requested it. To all who have bought, and reviewed the book, thank you. To those who have gotten it free, at least return the favor and write up a review for me over on Amazon. I would sincerely appreciate the feedback. If you have learned something new, write me and let me know. I promise to respond as time permits. If you utterly hate the book, let me know and let me know why. If you don’t want to write a review, send me a letter and tell me about it. Above all, if you see something in the book that bugs you like spelling or grammatical errors, something technical which you might question, or not understand, please let me know. Comments on the blog here are welcome. I’ll be maintaining that, as well as this blog in the future. I’d appreciate if people would share the links out both here and on Facebook. If you don’t have a copy and want to read it, this is your chance to not spend money. All I ask is that you take the time to write an honest review on Amazon.com and visit my Author page there, as well as my regular author page and post a comment. Thanks!